January 18 starts the week of prayer for Christian unity 2019. All Christians are invited to pray together for the unity of all Christians in the world all week till January 25. We should always remember Jesus’ prayer for his disciples in John 17:21 “They may be one so that the world may believe.” By these words Jesus expresses the idea of the unity of the whole Church, that is the main purpose of His prayer. The contemporary world is full of corruption, greed and injustice bring about inequality and division. As Christians, we believe in the power of Christ to forgive us and heal. So we find ourselves united under the cross of Christ, calling both for his grace to end injustice and for his mercy for the sins which have caused our division. This week of prayer for Christian unity 2019 we should join and pray together with other Christians all around the world. This will show to the world the great unity of Christian Churches. The Week of Prayer for Christian Unity 2019 has been prepared by Christians from Indonesia. Indonesia is well known for having the largest Muslim population of any country. However, about 10% of Indonesians are Christian from various traditions. Across the diversity of ethnicity, language, and religion, Indonesians have lived by the principle of gotong royong which is to live in solidarity and by collaboration. This means sharing in all aspects of life, work, grief and festivities, and regarding all Indonesians as brothers and sisters. This always fragile harmony is today threatened in new ways. Much of the economic growth that Indonesia has experienced in recent decades has been built on a system that has competition at its heart. This is in stark contrast to the collaboration of gotong royong. Corruption is experienced in many forms. Christian communities in such an environment become newly aware of their unity as they join in common concern and a common response to an unjust reality. This year biblical text for the week of prayer for Christian unity 2019 is taken from Deuteronomy 16: 11-20, these Bible verses speak powerfully to Indonesian Christians situation and needs. The main theme for the 2019 year is “Justice, and only justice, you shall pursue …” (Deuteronomy 16:20). Before the people of God enter the land, God has promised them they renew their commitment to the Covenant God established with them. The pericope comes in a chapter whose central theme is the festivities to be celebrated by the Covenant people. After each festival the people are instructed, “Rejoice during your festival, you and your sons and your daughters, your male and female slaves, as well as the Levites, the strangers, the orphans, and the widows resident in your towns” (Deut. 16:14, see also 16:11). Christ’s Church is called to be a foretaste of God kingdom. However, in our disunity, we fall short. We fail to be the sign of God’s love for his people. Injustice has fed the divisions of the Church. We repent of the injustice that causes division, but as Christians, we also believe in the power of Christ to forgive us and heal. And so, we find ourselves united under the cross of Christ, calling both for his grace to end injustice and for his mercy for the sins which have caused our division. For each day of the week of prayer for Christian unity 2019, different prayers are proposed. 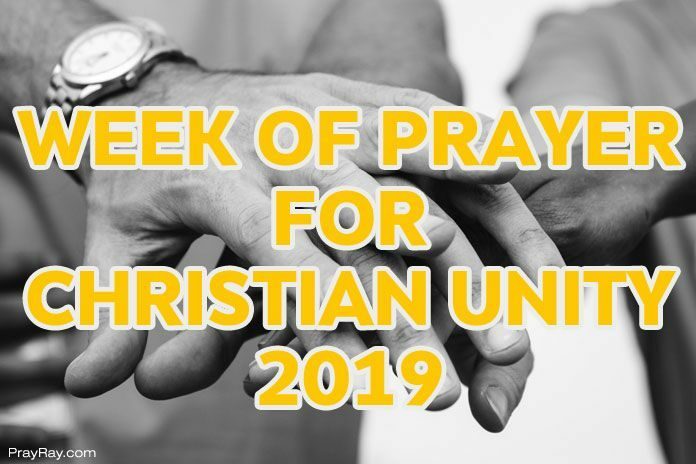 So join the week of prayer for Christian unity 2019 and pray for the Christians unity in the world. You have shown us the path of justice. Help us to follow your way by doing justice as our worship of you. As Christians together, may we worship you not only with our hearts and minds, but also by our deeds. so that many people may be strengthened through our works. grant us wisdom to distinguish right from wrong. Let our hearts be guided by honesty and our lips speak the truth. Give us courage to be truthful even when others go against us. spreading good news for all people. We pray in the name of your Son, Jesus Christ. Amen. we give praise to you for your great glory made manifest in all of creation. Give us an open heart to embrace all who experience discrimination. This prayer we make in your holy name. Amen. we thank you for your bountiful gifts. in simplicity and with humble gratitude. By your word all things came to be. which manifests your glory, beauty and kindness. and together to be prophets of your good news to all creation. Amen. the words of the Canaanite woman moved Jesus to heal her daughter. that women bring to the service of the Church. and showing us your light in times of darkness. Transform our lives so that we may be a blessing for others.